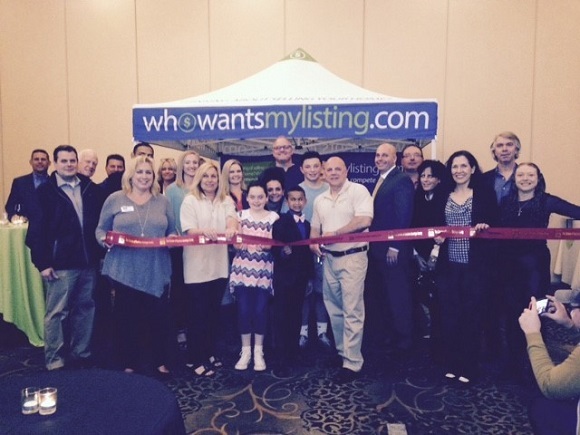 We kicked off the new business for Jules Ianniello called WhoWantsMyListing. Through WhoWantsMyListing, a home seller can post their listing to local qualified real estate agents for free. Then you can compare each proposal for competitive offers and hire the real estate agent who will best fit your needs. When Real Estate Agents compete, you win! Pictured center is Jules Ianniello and his wife Becky with their two sons along with family, friends and real estate agents. Flanking the ribbon is Donna Connor of On the Go Concierge & Events and Chamber Ambassador and Linda Tepper, Wellness Solutions Specialist and Chamber Ambassador.